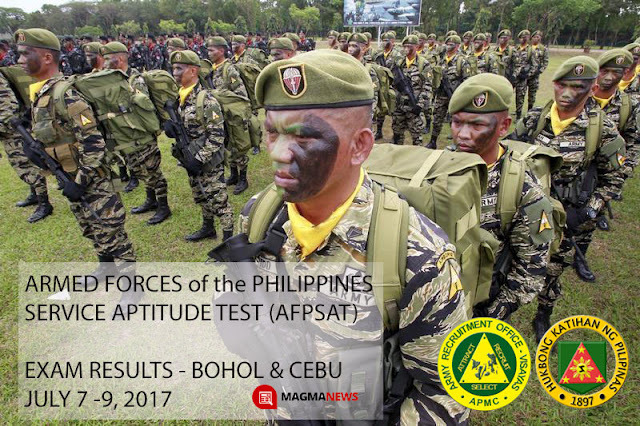 AFPSAT Results July 2017 Bohol & Cebu - AROVIS - Exam News, Reviewer, Military Career, & Everything [MN] . . The Army Recruitment Office - Visayas (AROVIS) branch released the results of the Armed Forces of the Philippines Service Aptitude Test (AFPSAT) which was conducted at Cebu and Bohol military testing centers from July 7 to 12, 2017. The result was posted by Army Recruitment Office of Visayas through their Scribd account. Below are the results of AFPSAT arranged according to examination date by alphabetical order with remarks if pass, retake or no retake.